To me first days of New Year has always be a good opportunity to stop for a moment and sum up what happened during last year. To think about what I am satissfied with and what I would like to change in upcoming year. Even though it’s just the date changing, with 1st of January I feel like it’s a new chapter full of possibilities opening. Therefore in the beginning of the year I look for new inspiration and ideas especially hard. Want to find out what inspired me this winter? Check my Winter 2017/18 inspiration & discoveries. Since I started earning money I used to put quantity over quality when it comes to buying fashion products. It resulted in wardrobe full of cheap, badly sewn clothes in all colors and shapes. At some points I had that many clothes, I had problems in digging into them which caused constant „I have nothing to wear” frustration and often ended up in wearing the same 5% of my wardrobe all the time. I’ve been reading about the concept of minimalism and decided to try it out in a field it seemed relatively easy to implement: my wardrobe. What I found helpful was reading „Elementarz stylu” by polish fashion & style blogger, Kasia Tusk. 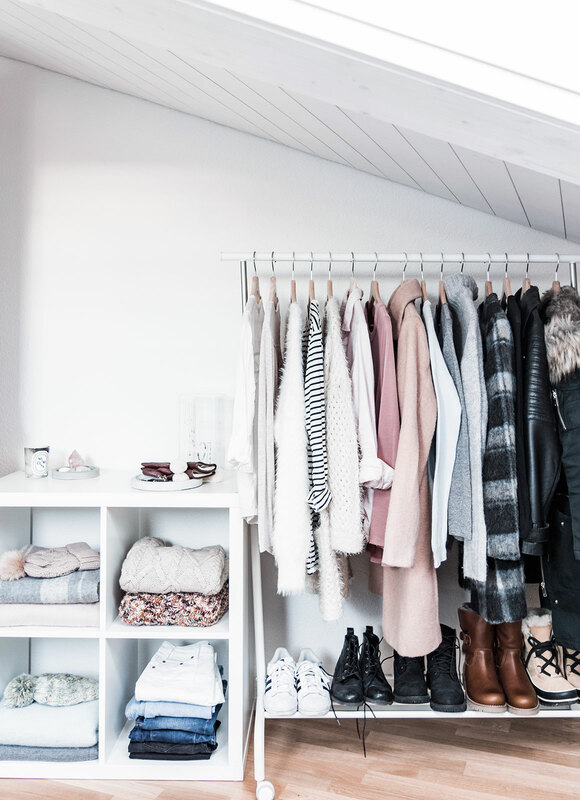 Kasia doesn’t only explain what makes a fashion product high quality but also recommends a clothing base: 20-30 products you should have in your wardrobe to have „something to wear” on every occasion. everything I don’t feel good in NOW goes out. I don’t keep clothes for a „future, better me” – slimer, more muscular or tanned. everything I haven’t been wearing for 2 years goes out. You could be surprised how many items I got rid of. everything that is bad quality or damaged, with not much chance I will repair it in a close future, goes out. I decided to follow a color line consisting of 4 colors I like best and that suit each other well: white, grey, blue and dusty pink. Also, around 90% of my clothes now are plain, not much patterns like flowers or geometric shapes. So much time for matching different colors and patterns saved! I bought some better quality basics that are classic, easy to match with other items and never out of fashion. Find out more about my new purchases in next paragraph! I’m still very far from considering myself a minimalist but at least I’m one step closer to small but consistent wardrobe filled with items I truly love. Beautiful ecru pullover with braided sleeve. 64% of mix of wool and moher. Very warm and cosy. Here matched with fake leather mini skirt and black leather biker boots. Navy jacket, sailor style with golden buttons. Soft and pleasant mix of viskosis, poliamid and elastan. Here with plain, grey, cotton shirt and ripped boyfirend jeans from H&M. Very warm and fluffy, in my favourite color this winter: mauve sweater. In majority made of the mix of wool and moher. Here with plain cotton black dress and leather shopper bag by Fossil. Blue mid-long shirt dress. On the first photo it looks like made of jeans but it’s plain 100% cotton fabrics, printed in blue and white stripes. Looks good with old grey winter boots and my beloved grey watch by The Fifth. 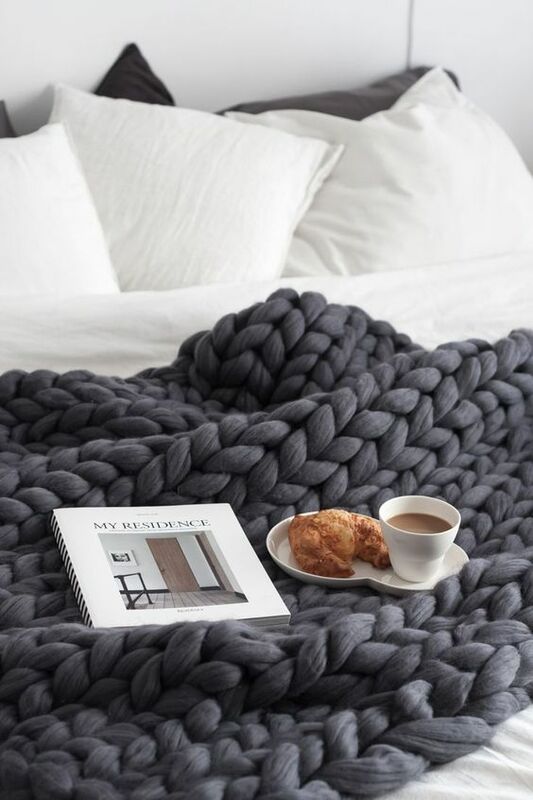 Inspired by my work collegue Jenny, I discovered this perfect winter DIY: arm-knitted, thick and fluffy, super cosy blankets! They are pretty expensive if you’d like to by one ready made but it gets much better if you buy wool and knit them yourself. Sounds like a good plan for cold winter weekend evening! I have no experience with knitting, nor with funny wool like that but still I’m willing to give it try and knit a nice blanket before the spring comes. Do you like this kind of knitwear? Maybe you have some easy DIY tutorials for beginners to recommend? Looking forward to your comment! This year will hopefully be different not only because I understood it’s every day choices rather than big words that bring you closer to your goals. It’s because I decided that this year I will only plan what’s explicit priority to me, leaving the remaining time for spontaneous activities, unexpected circumstances or simply time for myself. Did you like my Winter 2017/18 inspiration & discoveries? Pin it to Pinterest board or share with your friends! I wish you all the best in 2018 !! 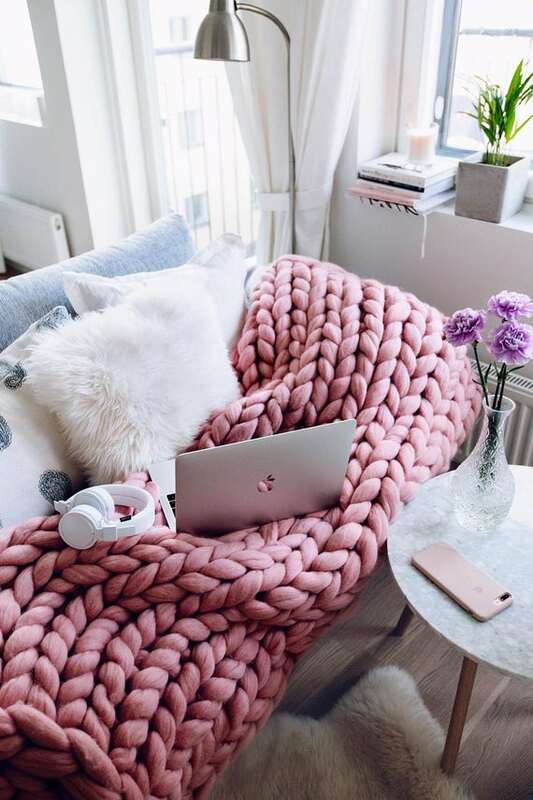 Photos: minimalistic wardrobe & pink blanket: Pinterest. Rest of photos and collage: Marta, lilmissboho.com.